Penny Lively loves running her family’s winery, but to keep business growing, she needs to find a way to attract more guests. 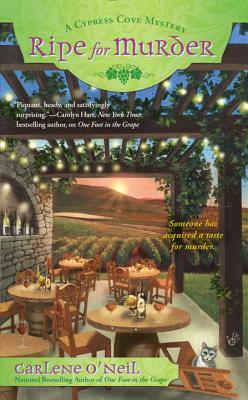 When she’s approached to invest in a new train line through wine country, Penny and her intoxicating winery manager, Connor, hightail it to a lavish resort to hear the details. Unfortunately, her neighbor’s daughter, Chantal, is also there, swirling up trouble by flirting with the married investors—and with Connor too. Carlene O’Neil is the national bestselling author of the Cypress Cove Mysteries, including Ripe for Murder and One Foot in the Grape. A former television writer, she is currently a commercial real estate broker in the Los Angeles market. She grew up in the heart of wine country in northern California, and is accredited by the Wine and Spirits Education Trust. Currently she lives in Valencia, California. The Cypress Cove Mysteries are set along the central California coast, and the similarities between the fictional town of Cypress Cove and the stunning town of Carmel are no accident.